These cute DK baby socks will help to keep precious little feet warm. The instructions are for three sizes: 0-3 months, 3-6 months, 6-12 months. Knitted here in Knitcol 100% merino wool but suitable for any DK/6ply sock yarn and perfect for using up yarn left-over from knitting adult-sized socks. Our double-knitting sock patterns continue to be very popular so November's sock is a variant on the basic DK sock pattern. Knitted in Rico Superba Tweed 6ply but suitable for any DK/6ply sock yarn, it features a textured rib pattern on the leg and reinforced heel. The instructions are to fit shoe sizes 6 - 12. 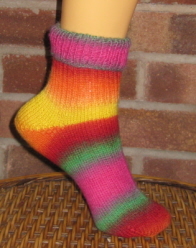 September's sock pattern is for a woman's sock. 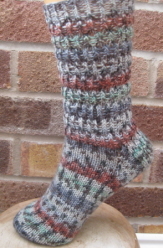 The simple basket stitch provides texture and highlights the shades of variegated yarn. 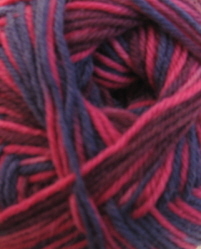 It is shown here knitted in - perfect colours for Autumn. Shown here knitted in . The simple mock-rib pattern provides good stitch definition and gives the socks some stretch too. Initially these were going to be men's socks but the design is so versatile that they're now unisex. 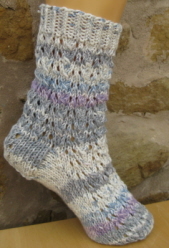 The socks are shown here knitted in two different yarns: the sock at the back of the picture is in Woolcraft Superwash Sock Yarn (Denim Blend) and the one at the front in Wendy Happy (Flora). The instructions are for shoe sizes from 4 - 11. These pretty ankle socks reflect two key fashion trends for Spring - pastels and fifties-style. 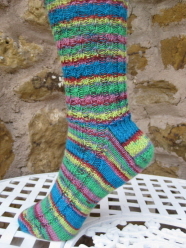 The socks have a frilly cuff and the rib leg is matched by a reinforced heel. The pattern comes in sizes small, medium and large - to fit shoe sizes from 1 - 9. 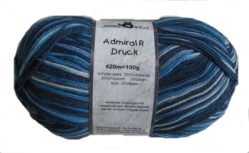 The pattern is suitable for any 4ply sock yarn - this one is knitted in lovely, soft from Adriafil. 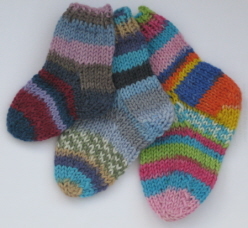 Keep your feet warm with these cosy cotton socks - perfect as bed socks but also ideal for wellies or boots. Knitted in Fiore, an aran-weight cotton yarn, on 4.5mm needles - you'll have them finished in no time!